A large and unprecedented photographic retrospective containing historical as well as rare and sensitive images, some of which were smuggled out of East Timor, most of which were publicly viewed for the first time.The exhibition comprised an extensive collection of photographs spanning fifty years and derived from sources as diverse as the Australian war memorial, internationally based photographers and the clandestine network in East Timor. Co curating East Timor: 1942-1992 involved working with a range of stake holders including principal sponsor Oxfam Australia, the East Timorese community in Australia and local & international photographers, to build a cohesive and successful national project. As the exhibition toured Australia, it increased public awareness and support for East Timor's independence campaign by informing people of East Timor’s history, its links with Australia during World War 2, and its occupation under Indonesia, which was supported by successive Australian governments. As it toured the country, the exhibition raised the profile of the independence movement by identifying East Timor as a human rights issue highly relevant to Australians. 2) Photographer & Digital Artist. Kia collaborated with Australian composer Martin Wesley-Smith to create audio-visual pieces on East Timor, promoting East Timor’s independence campaign through multi-media, both in Australia and internationally. Balibo: audio-visual piece, Art Gallery of NSW. Sydney, 1993. November 12: audio-visual piece. University of Technology, Sydney, 1993. Quito: multi-media theatre piece produced onstage by the Song Company of the Australian Opera. Sydney, 1994.
national performances: Rozelle Conference Centre, 1994. Newtown theatre, 1996.
international performances: Holland-1997; Belgium-1997; Denmark-1998; Malaysia-1999; Portugal-1999. 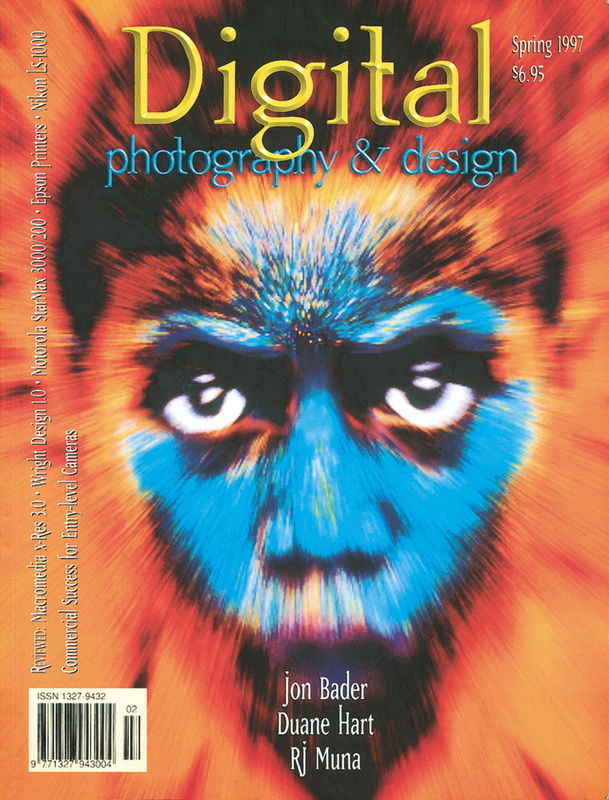 national covers: Digital Photography and Design, 1997. Television: SBS TV. Arts program: Imagine, 1994. Film: contributing photographer for Annie Goldson's documentary film on East Timor: Punitive Damage. Sydney Film Festival world premiere, June 1999. Awarded 2nd prize (official festival selection) and audience choice for best documentary. overseas aid & development. Timor Leste. 2003-2004. Field work for Australian aid and development agency, Austcare involved forming a team with an Australian permaculture trainer and local NGO partners Fundacao Halarae in Dili, to work together on a food security project with villagers in the Bobonaro district. The project used hands-on training in permaculture strategies and techniques to facilitate local people to re-establish their subsistence farms; and field training for Halarae staff to independently lead their own future projects. Following a community consultation process with local elders, 18 farmer leaders from 7 villages in Balibo sub district, including women, joined the project. Directly applying permaculture techniques learned daily through demonstration, farmers established kitchen gardens, planted a range of legume & root crops on three farm sites, and joined 50 children to plant 75 fruit and nut trees at their local primary school. A unique and long running community performing arts collective, staffed entirely by volunteers producing a weekly ‘open mic’ night in Sydney. An all ages, alcohol free event with entry by donation, Brackets and Jam operated in several inner city venues over many years, consistently providing a highly accessible live venue to performers and audience alike, and contributing significantly to the performing arts in Australia. In late 2013, B&J was re-established by some of the original members and continues to enjoy success as a weeklycommunity access performance night. This indigenous and multi cultural performing arts festival was held on New Year's Eve 1999-2000 at the internationally renowned Woodford Folk Festival in Queensland, Australia. Twenty acts comprising 105 national and international performers took part in a five-hour show celebrating cultural diversity and dedicated to the unity of all peoples. The concert included a message of world peace from His Holiness The Dalai Lama. In addition to a live audience of 30 000 people, this concert was the only Australian New Years’ Eve event outside Sydney chosen by CNN for inclusion in a live global television broadcast to 1.5 billion people for the new millennium.